Where there's smoke there's fire! Public policy both reflects and drives social and economic change. The ACT is commonly acknowledged as a progressive community with many legislative ‘firsts’ under our belt and changes to our tobacco legislation include some of these firsts. The 1980s saw a period of strong anti-smoking campaigning. For the first time cigarette sales were on the decline and the community members were starting to emphasise their right to live, work and play in smoke-free environments. In 1990 the ACT raised the legal age for the procurement of tobacco products from 16 to 18 years, with the then Minister for Health, Gary Humphries warning young smokers that even ‘written permission from their parents’ would not suffice. In 1994 the ACT became the first Australian jurisdiction to ban smoking in restaurants, and by 1998, the first to ban smoking in enclosed areas of pubs and clubs. In 2010 we were also the first to enforce display bans for general retailers of tobacco products. However, as with any change in legislation, not everyone in the community was happy. Business owners, particularly restaurateurs, had grave concerns, with the chief executive of the Tobacco Institute of Australia warning that a total smoking ban in venues would be disastrous for business. By 1995, with the legislation already partially implemented, some Canberran smokers even started their own political party with the ‘Smokers are Voters and Civil Rights’ party running in the 1995 election and winning approximately 2.3 per cent of the overall vote. Records regarding debate and amendment of the Tobacco legislation were among those identified this year as available for public access, and for this reason they have been chosen as ArchivesACT’s September Find of the Month. Tobacco was thought to be first brought to Australia by Indonesian fisherman in the early 1700s who used it to trade with the Indigenous population. 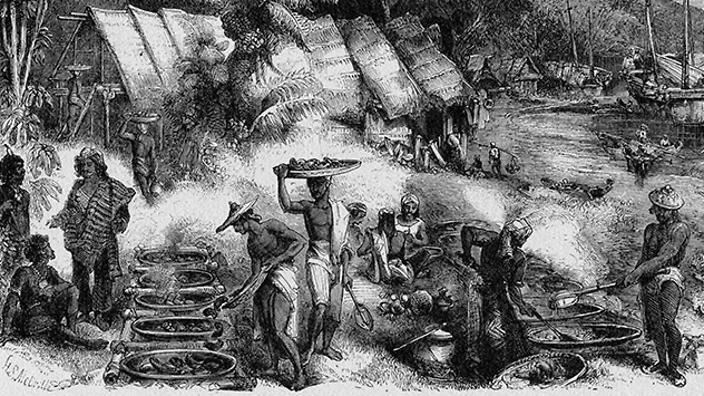 With the establishment of the first European settlement, tobacco continued to be imported, becoming a valuable item to barter within the community. Although tobacco was originally banned as a non-essential crop, it wasn’t long before it was legalised. 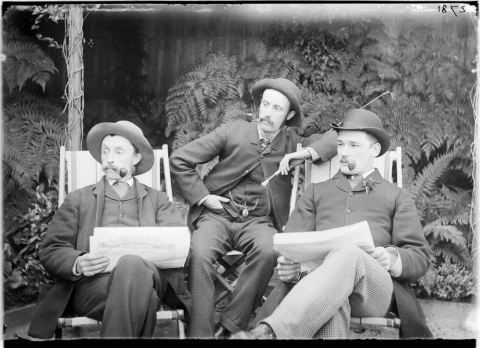 Pipe smoking was the most popular form of consumption and handmade pipes were imported from all over the world. It was only once bulk manufacturing of cigarettes became possible in 1880 that smokers shifted away from pipes in favour of cigarettes. 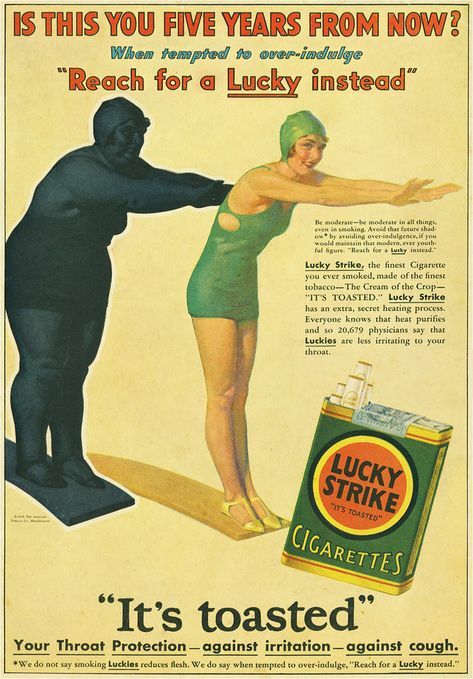 Men were the traditional consumers of tobacco products but by the 1900s, with the increase of female participation in the workforce after two world wars, tobacco advertisers began to target women. Research undertaken by the Cancer Council shows that this targeted marketing created a steady increase in the percentage of female smokers that continued to grow well into the 1970s. Australian consumption of tobacco products peaked in the 1960s and early 1970s due to socio-economic shifts and aggressive marketing by the tobacco companies. However, this trend was about to come undone as evidence about the health effects of smoking started to emerge, and anti-smoking advocates started their own campaigning, leading to a decrease in both new smokers, and in overall consumption, that continues to this day. For almost 140 years, tobacco crops continued to be harvested in Australia, albeit under government supervision. However, despite having this locally grown product, Australia never maintained its own tobacco industry. Although we did manufacture tobacco products locally, the plants was controlled by subsidiaries of three major global companies. In 2004 decreasing consumption of tobacco products saw one of these companies announce plans to start sourcing their tobacco from overseas. This prompted the Federal Government to undertake an ambitious and proactive initiative to end tobacco farming by buying back tobacco licences and paying farmers to change their crops. By 2006 this initiative saw the end to legal tobacco harvesting in Australia and consequently the closure of the manufacturing plants, with the last plant closing in 2015. Tobacco in Australia is now a wholesale industry, and although cigarette smoking continues to be in decline, an estimated 1,146 packs of cigarettes were still sold in Australia every minute in 2016. In 1983 the Australian Health Ministers met to discuss a policy on the control of smoking in public places. The then Minister for Territories and Local Government, Tom Uren, was keen to be represented in the ongoing discussion. He authorised a representative to participate in an inter-departmental working group to review existing tobacco legislation with a view to supporting the rights of non-smokers ‘to breathe air unpolluted by tobacco smoke’. These discussions initially relied on the territories to lead the way, as they were under Commonwealth control and the working group was able to use them as a test case for the rest of Australia. 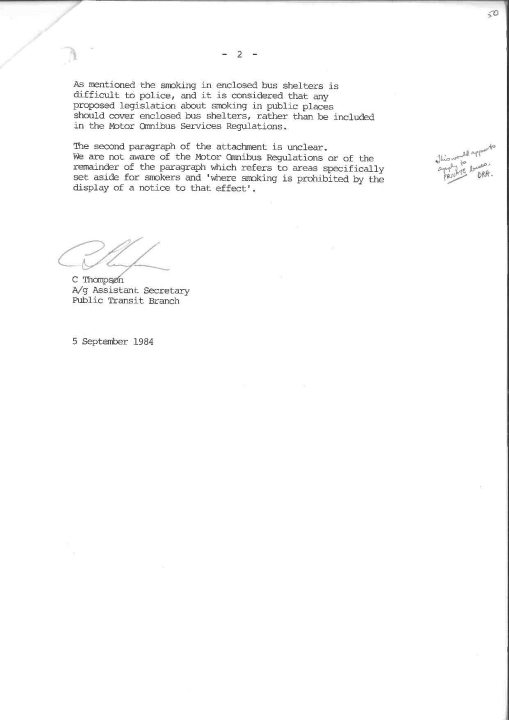 In 1984 advice on local smoking policy was sought from within the Department of Territories and Local Government, including public libraries, health facilities, the tourist bureau, swimming pools and Action buses. Interestingly, many of the responses included information regarding staff being allowed to smoke in spaces where the public were perhaps not. 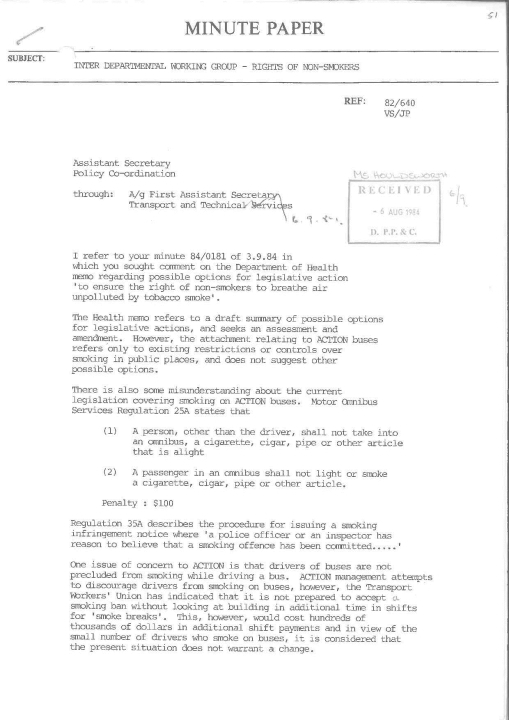 For example, the letter below regarding ACTION buses specifies that while it was illegal for passengers to smoke on buses, bus drivers were permitted to smoke while driving. This period of Commonwealth reflection seems to have been a turning point for the ACT. Whilst on the ground our city services were advocating for change by phasing in bans on smoking in public places and promoting the health benefits of quitting smoking, our public policy makers were busy researching and planning for legislative change to provide ongoing support for a healthier community. In 1989 ACT MLA Wayne Berry introduced a private members bill into the Legislative Assembly recommending a review of the tobacco legislation. Previously, as Health Minister, Mr Berry was as a driving force in tobacco reform, and his bill included provision for raising the legal age limit for smoking, increasing penalties for breaking tobacco laws, licensing cigarette vending machines, banning the sale of small packs and/or toys that promoted cigarettes, and banning advertising outside of point of sale and tobacco sponsorship. Both sides of politics quickly agreed that a bipartisan approach to reform was appropriate, due to the responsibility to reduce the ‘cost to society of self-inflicted diseases’. The policy discussions on record show the challenges faced by the ACT Public Service at this time. The amendments proposed were visionary, and as such, policy makers were unable to draw on existing Australian legislation from other states for guidance. However, it wasn’t until 1993 that serious debate regarding new legislation was underway, when Cabinet agreed to the development of legislation to introduce smoke-free enclosed public places within the ACT, originally titled the ‘Clean Air (Indoor Tobacco Smoke) Legislation. Wayne Berry, by then returned to the role of the Health Minister for the ACT, prepared a discussion paper for public comment. The public commentary received showed overwhelming support for the new legislation, with more than 80 per cent of the respondents in favour of smoke-free restaurants. However, the legislation also had its detractors with both small and large business concerned that bans would lead to a decrease in customers, pushing smokers out of the smaller venues and into pubs. The Australian Hotels Association were particularly vocal, claiming that this would be a disaster for ACT Tourism and labelling the government ‘the smoke police’. After rigorous debate in and out of the Assembly, the government conceded with disappointment that smoking in some areas such as bars, gaming areas, hotels and motels was too socially ingrained and complex to include in the new ban, and on the suggestion of independent MLA Michael Moore, it was decided that the legislation should be phased-in, alongside testing of air quality, to allow a period of adjustment for business. 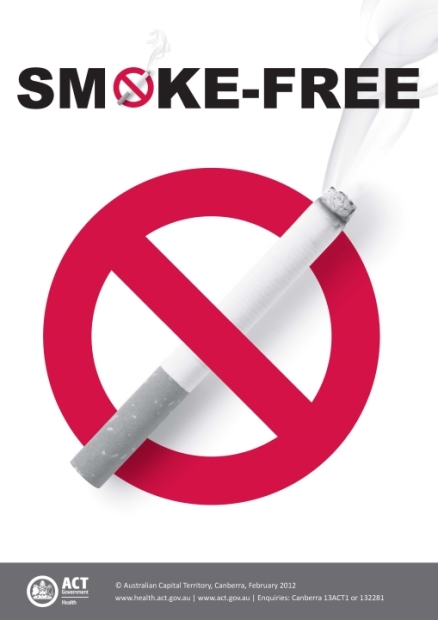 On 1 December 1994 the Smoke-free Areas (Enclosed Public Places) Act 1994 took effect. It included a 60 day leeway for businesses to meet their new obligations. The initial definition of ‘enclosed public areas’ was amended to focus on restaurants and other food venues but to still allow smoking in venues whose primary business was the serving of alcohol. Reporting by the Canberra Times would show that this approach was not particularly successful as many businesses remained uncompliant well after the 60 day grace period. It is not clear whether this was due to deliberate non-compliance, a lack of available information, or a combination of both. The community was, however, overwhelmingly in support of this policy, and it wasn’t long before other states followed in the ACT Government’s footsteps. The legislation was amended in 1998 to include a partial ban in smoking in enclosed areas of pubs and clubs. This would be extended again in both 2006 and 2010, when smoking was eventually banned in outdoor eating and drinking places (other than in designated outdoor smoking areas of licensed premises) and at under-age functions. Australia is now considered a world leader in tobacco control. Recent changes such as plain packaging laws for tobacco products, increased taxation on tobacco and the prohibition of tobacco advertising, promotion and sponsorship have seen a reduction in Australian smoking rates of 13 per cent from 1995 to 2016. The ACT’s contribution to that reduction has been a significant one. Do you remember when you could smoke in venues? Contact us to share your story! If you are interested in further research on this topic, please contact ArchivesACT through our "Request a Record” service. NAA: A1200, L20646 Agriculture - Tobacco - A wrapping machine in the Phillip Morris (Australia) Ltd., cigarette factory at Moorabbin, a suburb of Melbourne, Victoria. 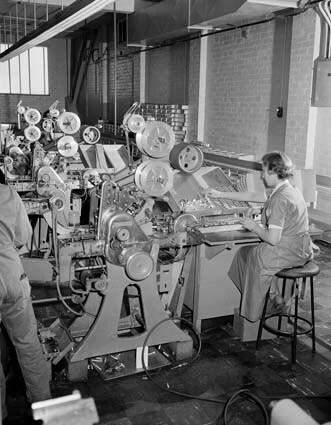 The machine wrap the packets of cigarettes in cellophane and passes them on to the despatch section [photographic image] / photographer, Neil Murray.